Tuesday evening was a night to remember along the Orihuela Costa with hundreds of people lining the streets of the town to welcome their Majesties, the Kings of the Orient, Gaspar, Melchior and Balthasar. The Three Kings and their entourage threw sweets and toys into the crowds as the colourful parade made its way to Zenia Boulevard commercial centre, where the Kings shared some time with the children. Then the festivities continued after a short speech by the Kings to thank everyone for attending and wishing everyone health, wealth, love and happiness for 2016. As in previous years, Torrevieja's three Kings arrived by boat to be greeted by hundreds of children who followed the entourage through the streets of the town. 2016 featured one of the largest and colourful parades or many years, which consisted of a dozen floats, local bands, horsemen, exotic belly dancers, Disney characters, donkeys, geese, chickens, etc. 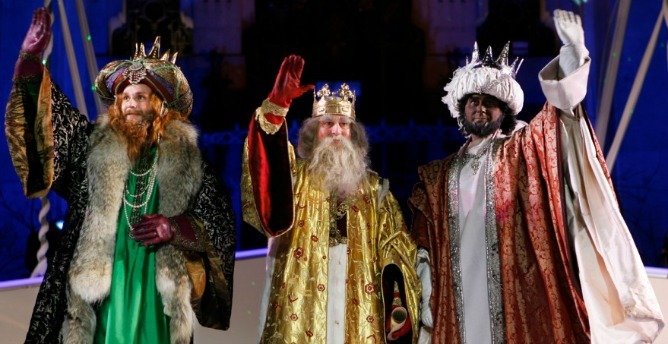 They all accompanied the Three Kings led by Melchior, the one with the white beard, Gaspar, and the dark skinned Balthasar, from Africa. In both towns the children waited in anticipation with their plastic bags, hats and caps, trying to catch some of the thousands and thousands of sweets and toys that were thrown into the crowd by the Kings and their assistants. After the parade, the children left for home with their parents to feast on the sweets, deserts and the traditional, round, Spanish Christmas cake, Roscón de Reyes.